Hey! What are you doing for breakfast? Let’s have breakfast together this morning! 🍳 So grab your coffee and let’s share a meal – I’m serving up Avocado Toast! Ok, it would be tough to drop everything you’re doing to fly to Fresno for breakfast right? But after seeing this, you might want to! 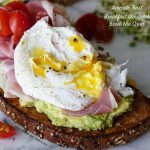 Avocado Toast Breakfast Sandwich – an easy knock-your-socks-off breakfast done in ten minutes? This is a meal I am so excited to share with you! Perfect for breakfast, lunch or brunch. No fancy sauces to make, if you can toast bread, mash avocados and soft boil an egg. You’re set! So speaking of toasting bread, the first time I made avocado toast I had an issue with the toast. I thought, rather than use the toaster, I will put it under the broiler. So I turned on the broiler. When it was completely heated up tucked the bread underneath it…. And promptly forgot I had put bread under the broiler. I kid you not it was charcoal by the time I remembered it. I did not take a picture of it. I’m pretty sure you know what burned bread looks like. And taking stylish pictures of burnt toast didn’t seem to make sense either. Seriously?? oops! You know if burnt toast is the worst thing that happened that day, that’s pretty good, right? 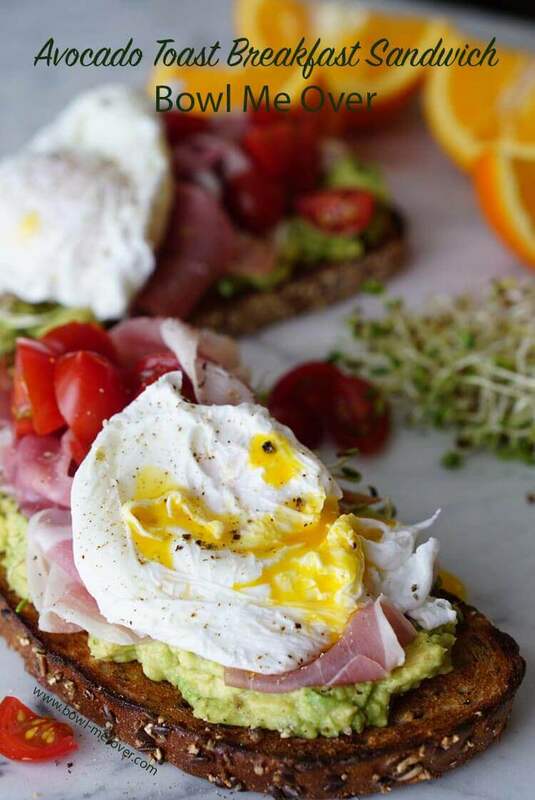 Toast – Avocado and Tomatoes – Prosciutto – Sprouts – Egg = Deliciousness! The soft poached egg makes it’s own sauce for this delicious Avocado Toast! Ok back to this yummy sandwich – avocado toast is really quite the thing right now! I’m not jumping on the bandwagon because it’s trendy – I’m sharing this recipe with you because it is AMAZING! Let me show you how simple it is! Put water in a pan to boil. While the water is heating, mash the avocado. Season with salt, pepper and a squeeze of lime or lemon. Slice the tomato and add them to the avocado. You’ll need a couple slices of prosciutto per sandwich – this meal is two servings, so you’ll need four slices. Crack the eggs in two separate bowls. When the water boils, add about a teaspoon of white vinegar to the water and a good pinch of salt. Using a spoon begin swirling the water around to make a whirlpool. Drop in the eggs, one at a time. Set your timer – three minutes will give you perfectly soft poached eggs. When you remove the eggs from the water, use a slotted spoon and blot them with a towel to remove the water. Then it’s time to assemble the sandwich – Slather each piece of toast with the avocado-tomato mixture. Top with two slices of prosciutto, a nest of sprouts and settle the poached egg into the nest. Season with salt & pepper. Serve and enjoy! What’s for breakfast? 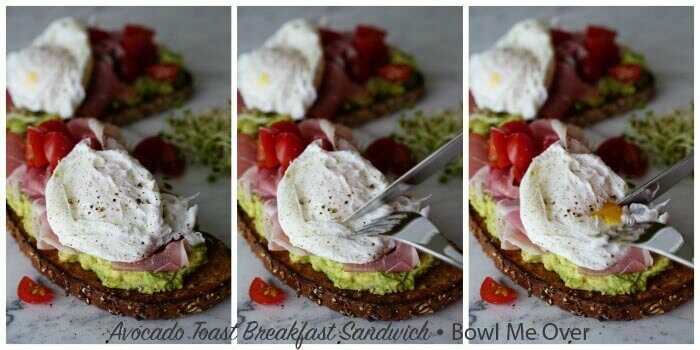 This Avocado Toast Breakfast Sandwich is fabulous & easy – my kinda meal! Hungry for eggs? More delicious breakfast recipes! The soft poached egg makes it's own sauce for this delicious Avocado Toast Breakfast Sandwich. This is easy, delicious - simply fabulous meal! Put water in a pan to boil. While the water is heating, mash the avocado. Season with salt, pepper and a squeeze of lime or lemon and the zest. Slice the tomato and add them to the avocado. Mix together and set aside. Crack the eggs into two separate bowls. When the water reaches a boil, add about a teaspoon of white vinegar to the water and a good pinch of salt. Using a spoon begin swirling the water to make a whirlpool. Drop in the eggs, one at a time. Set your timer three minutes - this will give you soft poached eggs. Assemble the sandwiches. Slather each piece of toast with the avocado tomato mixture. Top with two slices of prosciutto, a nest of sprouts and settle the poached egg into the nest. Season with salt & pepper. Serve and enjoy! What else has been cooking here at Bowl Me Over? I have been crazy busy!!! Have you listened to the podcast yet? I was interviewed by Stacey from Little Figgy of the Fare Traveler. It was super fun and the first time I participated in a podcast! You can listen to it by clicking here. Earlier this week I was a guest on YourModernFamily.com. If you head over there, you can check out my new recipe for 30 Minute Chicken Tetrazzini Stew – AMAZING! I love everything about this! I could live on avocados! Yum yum and yum! I could too Deb – breakfast, lunch, dinner or dessert – such a delicious versatile ingredient! This is such a flavorful way to start the day and it’s so pretty too. That egg is perfect! Thanks Julie!! I sure appreciate you stopping by! I love every ingredient in this open faced breakfast sandwich! Perfect for this weekend! Thanks Sandra – I hope you gave it a try, we had it again this morning – so yummy! I need to get back to poaching eggs for dinner. This looks perfect!! Thank you Christie, love a great poached egg too – such a yummy meal. Thanks for stopping by! 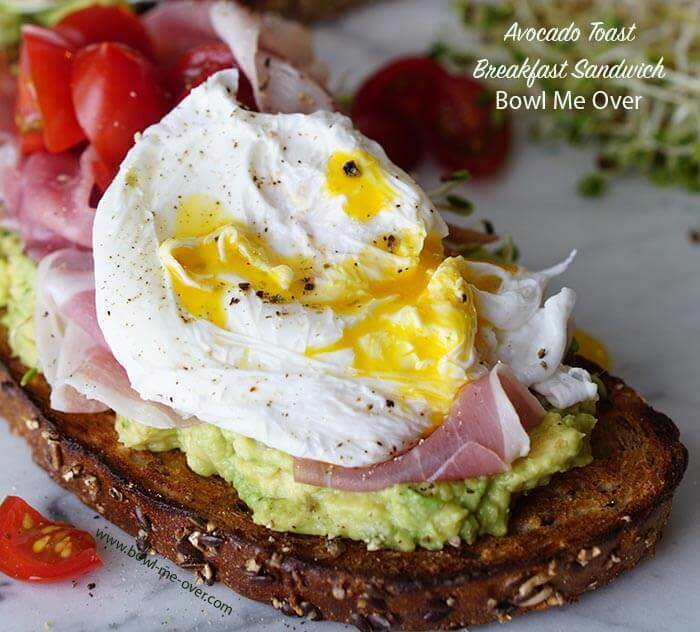 Totally love avocado toast for breakfast but the addition of the prosciutto is amazing! I will have to start poaching my eggs like my hubby likes again. If I’m feeling a little lazy I might just use a hard boiled egg. Can’t wait!! That would work too Jennifer! If you used a hard boiled egg, it would be great to slap another slice of bread on top, super yummy!!! I absolutely love this breakfast idea. We’re so addicted to avocados in this house! Us too Michelle – avocados are totally the best!! I absolutely love avocados on anything, but especially like this! I LOVE LOVE LOVE that you used prosciutto and sprouts on this sandwich! Such a winning combo! The salty prosciutto totally makes it, thanks Ashlyn!!! This is perfect!! Giving it a try int he morning! I know you’ll enjoy this easy meal Michaela!! Ohhhhh this looks amazing!!!! I love avocado on anything so yea, I need to make this one asap! Thank you Angela! This is our fav breakfast – so easy, but so much flavor – enjoy!!! This is so simple, but so perfect! I’m glad you found this blog helpful, it’s truly one of my favorite meals!! Avo on toast would have to be one of my favourite breakfasts. I order it all the time at cafes, no need to anymore. I can happily whip it up at home now. One order up Sara! 😀 Even better at home, enjoy! Yummy! What a great way to start the day. This looks so good and I love the idea of using prosciutto with this! Luci’s Morsels | fashion. food. frivolity. Thanks Luci! That prosciutto is just the perfect salty bite!! I love breakfast toast…this looks amazing with the egg. Enjoy Sandi, thanks so much for stopping by!! That poached egg looks perfection! Love avocado toast for breakfast or lunch ! Gotta love a great poached egg, thanks Shumaila! This sandwich looks PERFECT. All my favorite ingredients in one place. Bookmarking! Perfect for Mother’s Day or Easter Brunch! Thank you Jovita!! Looks luscious and ever so delicious! The perfect description for this meal, it is soo good! Thank you so much Patty for stopping by and checking it out! !